The term itself makes ones stomach drop. It conjures up dark historical memories of massacres and disasters, hurried group burials, and comingled corpses under mounds of cold dirt. The twentieth century alone bears witness to mass graves of millions: tragic reminders of man’s inhumanity to man. In recent days we have shuddered at the discovery of mass graves in civil war-torn regions of South Sudan and the Central African Republic. Mother Earth bears few mass graves with respect, but one of these surely lies in the National Memorial Cemetery of the Pacific above Honolulu. For sixty years Oahu’s warm breezes have passed over the well-tended mass gravesite in the Punchbowl cemetery, Section G, Grave #68. The ten-by-six foot granite marker is dedicated to the “Wake Island Defenders Group” of 178 men who lost their lives on Wake in World War II. 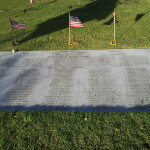 The names of 44 U. S. Marines, 3 U. S. Navy, and 131 civilians are engraved on the flat stone that rests in the green lawn of the Punchbowl crater, a few steps from the inner drive. The 178 names represent some, but not all, of the men who died on Wake Island; the remains interred below the marker include some, but not all, of those who died. After the war the remains were disinterred from known gravesites on Wake Island by the U. S. Army Quartermaster Graves Registration Units. These sites included a mass grave of about forty who had died in the first week of war, a burial of sixteen defenders who fell together during the invasion of Wake on December 23, a single grave of a civilian who died in the summer of 1942, and the controversial mass grave of the civilians massacred in 1943. Exact numbers in the mass graves could not be determined and other burial sites across Wake were never found. (The current JPAC mission seeks to identify remains discovered on Wake’s north beach in 2011). The disinterred remains were removed to Hawaii and recommitted in a group burial in the Punchbowl cemetery on July 10, 1953, under a single, simple marker. Officials invited Wake survivors and relatives of the deceased to attend the last rites of burial at a future date. The four-ton stone permanent marker was so large that it had to be “lowered into place by resting it on ice blocks which allowed it to settle as they melted.” The new cemetery had been dedicated on four years earlier on September 2, 1949, the fourth anniversary of V-J Day. Photographs from this early era show the bare slopes of the Puowaina crater rising to its unbroken rim. Sixty years later the vista is softened and the grounds are shaded by the graceful, wide-spread arms of big banyan trees. The mass grave was dedicated in a ceremony beginning at 11:00 AM on October 21, 1953, as the national flag flew at half-staff. According to accounts in the Honolulu Advertiser, eleven Marine survivors of Wake Island attended the tribute, as well as a number of high-ranking military leaders, and widows and family members. One newspaper photograph shows the father of one of the fallen marines kneeling to point out his son’s name as two generals and an admiral look on. Light and shadow reveal that it was a sunny day; a line of floral displays flanks the men and the stark outline of the crater cuts the sky behind. A second photograph depicts three kneeling women, their faces grim in sorrow: the widows of civilians Allen Cavanagh and Henry Ling, and the sister of Ralph Van Valkenburg, three of the ninety-eight Americans massacred on Wake Island in 1943. The dedication ceremony opened with the Marine Barracks band and drum and bugle team playing a funeral march as two companies of marines escorted the American flag to the graveside. A group of six marines and sailors served as symbolic pall bearers, carrying the flag alone in lieu of a flag-draped casket. Military chaplains representing the Catholic, Protestant, and Jewish faiths gave the committal service and prayers, followed by three volleys from a marine firing squad, the traditional announcement that a grateful nation had paid homage to its fallen heroes. A marine bugler played Taps, echoing off the crater walls. The Pacific Commander of the Fleet Marine Force, Lt. Gen. Franklin A. Hart, expressed the nation’s gratitude for the heroic sacrifices made by the Wake fallen and accepted the folded flag, which would be retired and later placed in the marine archives at Quantico, Virginia. And so it has been and is: a mass grave with honor.